Denna fina lägenhet nära centrum av Cala d'Or och med utsikt över stranden, är perfekt för en avkopplande semester i ett privat område med gemensam pool och direkt tillgång till stranden komplex plats. Stugan ligger på första våningen, är det mycket ljus, har en levande matsal, kök, två sovrum, två badrum och tre balkonger. Lägenheten är väl utrustade med luftkonditionering, TV, tvättmaskin och järn och säker. Mindre än 500 m, det finns restauranger, ett litet snabbköp, en busshållplats och taxistation för att underlätta din semester. Well equipped flat close to beach and shops in a family orientated resort. Nous sommes enchantés de notre semaine passée à Cala D'or. Nous avons été très bien accueillis par Florence, très sympathique et disponible avec en prime un beau cadeau de bienvenue. Bel appartement tout confort, propre et fonctionnel. Idéalement situé dans une résidence sécurisée avec accès direct sur la plage. Proximité des nombreux commerces, bars et restaurants, pas besoin de voiture. Tout cela nous a juste donné envie de revenir. Encore merci Florence pour votre gentillesse. Florence was the perfect hostess and made us feel very welcome during our stay. She also helped us get our bearings once we arrived. This was one of the nicest apartments we have stayed in & we particularly enjoyed the large balcony & sitting watching the world go by below us. 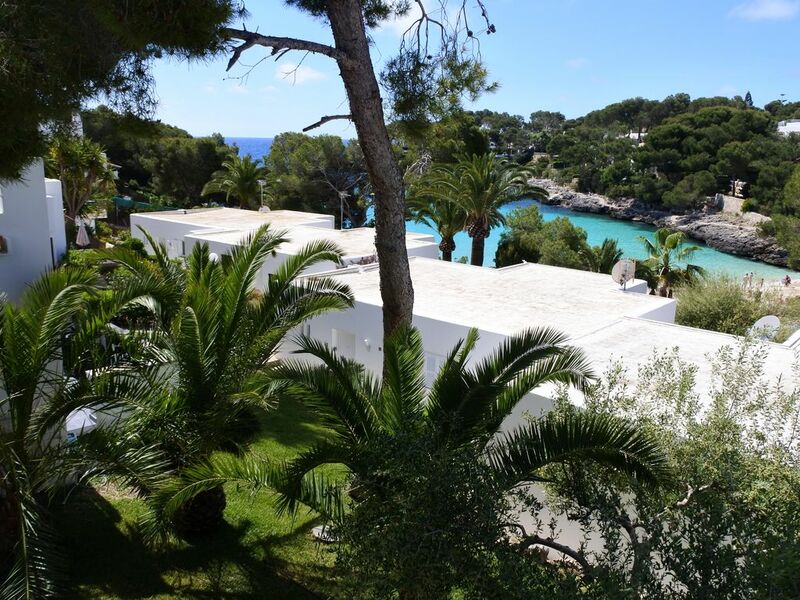 The apartment was very well equipped which made it easy to cook meals in, but saying that the location was ideal being in the centre of Cala Gran, for eating out too. All in all a lovely experience. Thank you Florence! What a surprise! We arrived late, so no view just yet, just the sound of the waves. But the next morning, what a great view! She had some drinks ready for us, so kind! So after a long travelling day without being able to visit the supermarket, the basics were there and we could enjoy drinking a nice glass of wine. Our 2 daughters really enjoyed having their own bed and having their bathroom. Lovely place, good parking around as well, thank you, Florence!! Florence from the initial enquiry through booking to wishing us a safe journey home was super efficient and helpful. The apartment was modern, well maintained and had everything we needed. Having stayed in the Cala Dor bungalows 3 tines previously we would suggest that this is our favourite and we will return. Very pleasant apartment on beach and close to all amenities. We had a really lovely stay at this apartment in Cala Gran. The apartment has new owners and is currently being done up to a lovely standard. A lovely wrap around balcony with patio doors from both bedrooms and lounge. Has a lovely large communal pool which is only shared by a few properties so no over crowding. Could do with a couple more loungers and canopies there tho. The apartments are gated of which you can access straight onto the beach which is beautiful . To hire 2 loungers and shade on beach is 15.70 euros for the day. It is close to all amenities, shops restaurants ,marina and other pretty little bays close by to stroll round in the evening. The square is a bit pricey but great meals. " pirate " restaurant we loved. If you walk away from the square towards Esmeralda & Figuera you will find cheaper restaurants and places for kids to play. Race tracks etc. In the property itself we found it very comfortable. The beds and pillows were great. Safe included in price. Flybe messed our flights up so Florence was very helpful and found us a hotel for our last night which saved us the headache of it all which was just across the road.